For all you faithful followers and stalkers of the blog, I know you are well aware (and anxiously waiting) the release of the short "Here We Go". It's coming kiddos, it's coming. Calm down. But I wanted to share some exciting news that is a first for me. I am doing a spin-off! That's right, I am currently developing a spin-off set in the world and events of "Here We Go". I am working on this story with the incredible Tim Daniel and Nick Johnson. This will be a larger story, but all based on the idea and world that you will see in "Here We Go". After I had the initial idea for "Here We Go", I emailed it to a bunch of close writing friends for feedback and everyone was really excited about the idea, but Tim was REALLY excited about it and it got him thinking about doing something more with it. So he started throwing some ideas at me and asked if I was interested in doing a larger story. Seeing his enthusiasm for the story and all the great thoughts he had for it...it was a no brainer to move forward. We then began looking for our final collaborator and through a mutual friend we were recommended Nick Johnson. Once Tim and I saw his stuff we both knew he was the guy to help bring this story to life. He's got great design and is really good at storytelling. Once we talked to him about it, he was immediately on board and excited about the project. So right now, the three of us are working out the story and will soon start working on putting together the pitch. The title of the new project is called "Dash, Bradbury". 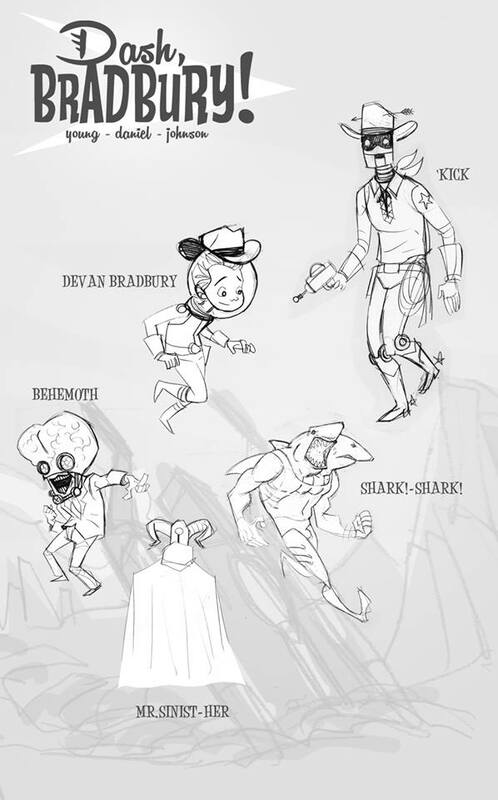 Below is a rough sketch Nick did, that Tim then threw a logo and credits on as well as some sketches for some of the villains that might appear in the story.